Do you like to decorate with nature for Christmas? This Christmas Plants and Gift Box card shows some of the prettiest natural and store-bought holiday decorations. Evergreen branches, red winter berries, ribbons, and ornaments with glittery swirls surround a brown and cream colored gift box. 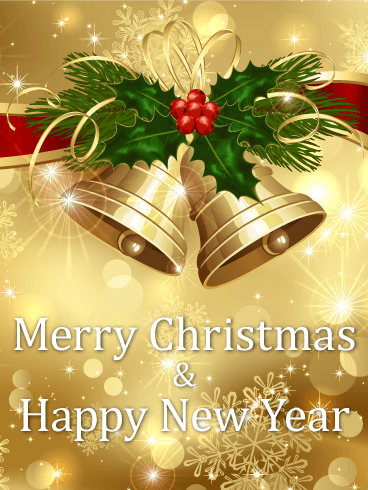 Use this Christmas card to send your wishes for a Merry Christmas & Happy New Year to your loved ones this season! And in case you didn't hear, oh by golly, have a holly jolly Christmas this year! 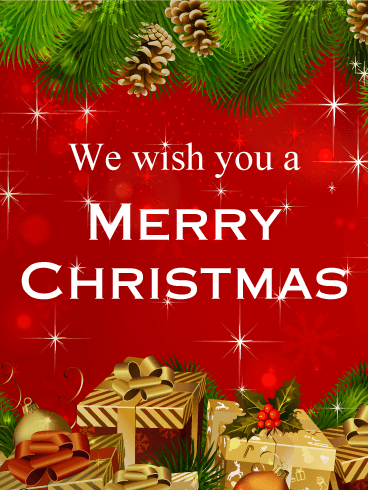 Send your holiday wishes with the holly & Christmas bells on this Christmas card. Stars and snowflakes fill the gold background and boughs of holly frame the center of this Christmas card. 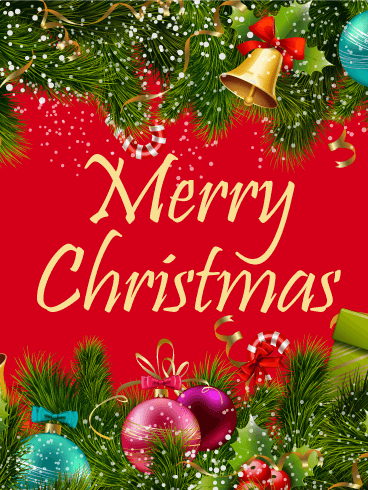 Red and gold ornaments, ribbons, and golden Christmas bells decorate the "Merry Christmas" message inside the frame. 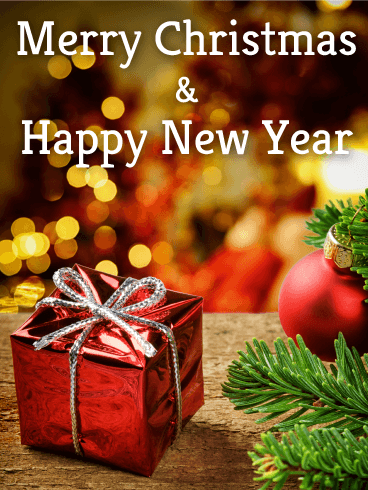 Use it for your holiday wishes today! 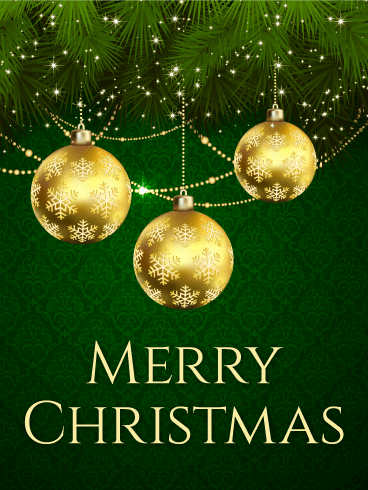 Ring in the holidays with this shiny golden Christmas bell holiday card! The gold background is filled with stars, snowflakes, and bright spots of light. 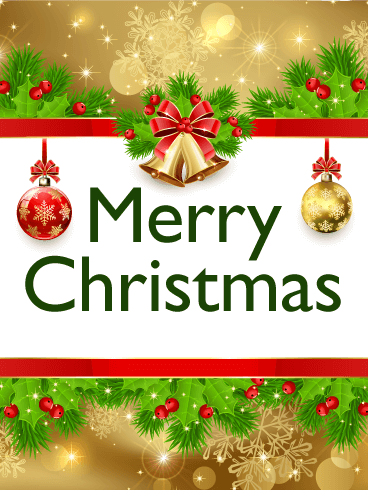 In the center, two shiny golden bells, fir branches, and holly hang above a "Merry Christmas" message. 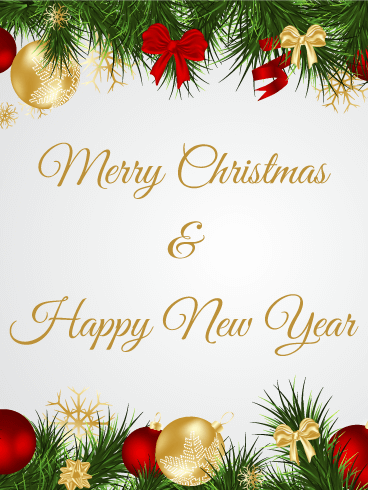 This message is set on top of a white snowflake and circled by a gold ring. Send it to everyone you know today! Nothing says Christmas like fir branches and bright, red poinsettia flowers. Bring Christmas cheer to your friends and loved ones with the poinsettia and fir branch decorations on this Christmas card! Fir branches, three sparkling poinsettias, and yummy candy cane decorations fill the bottom of this light-filled card. 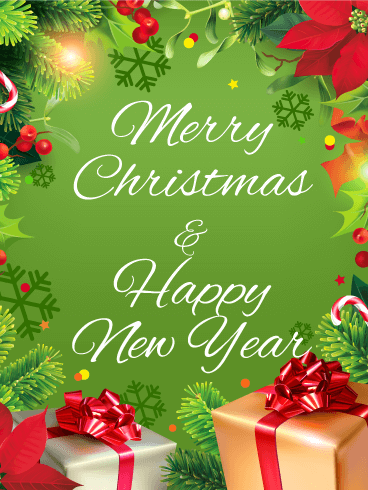 The wish for a "Merry Christmas" at the top will brighten the holidays for everyone you know! Make her heart thump with excitement this Christmas. Every woman loves gifts, but more often than not it's the small moments that coalesce into the holiday that create what she will treasure for years to come. Let her know that the small things matter just as much as the big things, and that you wish her the best of both this Christmas and New Year. Our Christmas ornaments have their own unique stories and appearance. This Gorgeous Christmas Ornaments card features several beautiful ornaments on a gold and white swirled background. The red, green, gold, blue, and white ornaments are joined by golden bells, candy canes, ribbons, and snowflakes at the top. 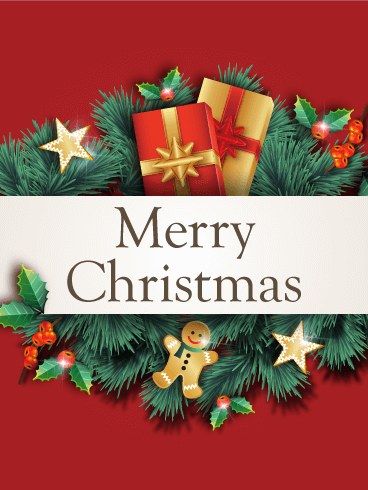 In the bottom corner, fir branches, pine cones, holly, ribbons, and candles rest under the "Merry Christmas" message. Give your family members the ultimate gift! The best things come in small packages, and not everything we want can be found under tree. Despite the pretty bow and perfectly creased wrapping paper, the present on this Christmas card is not the gift you are giving. It's the love you feel for your family, and nothing says it better than this Christmas card. Decorations are the best part of a holiday celebration! The Christmas leaves and ornaments on this Christmas card are a great way to send holiday cheer to your coworkers, friends, and family! 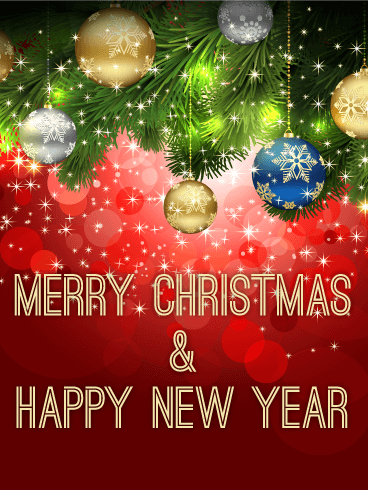 Fir branches, ribbons, pine cones, holly, snowflakes, poinsettias, bells, striped candles, presents, and red, gold, and white ornaments frame the patterned red background, while "Merry Christmas & Happy New Year" is written in the center. Are you sending a gift basket to a loved one this Christmas? 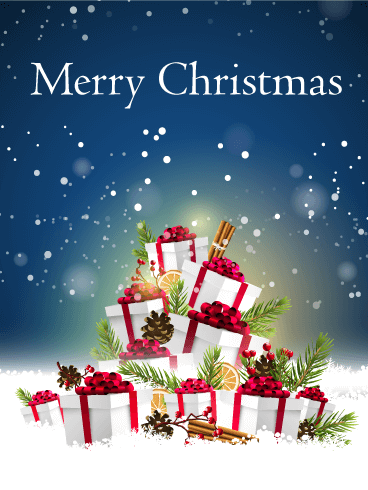 Send this Christmas Presents & Pine Cones card with it! This card features a gentle snowfall through a night's sky. On the snow below, a pile of white and red presents wait to be opened. Pine cones, evergreen branches, winter berries, slices of fruit, and sticks of cinnamon are scattered throughout for an extra Christmas surprise. 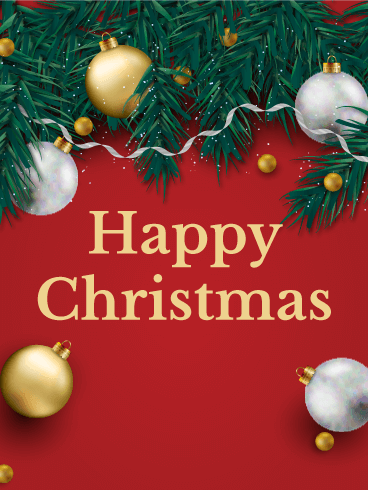 Say "Merry Christmas" to your loved ones with this cheery Christmas card! Do you know someone who loves decorating for Christmas? 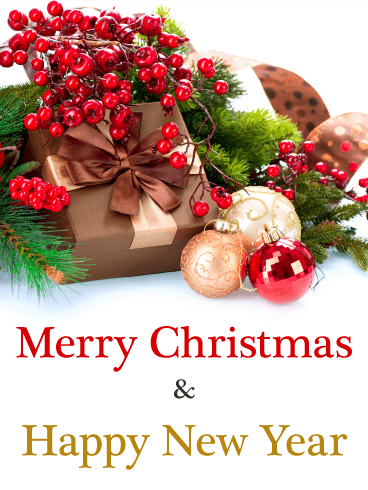 Send them this colorful Christmas card! Christmas tree branches frame the top and bottom of this red card. Each branch is dusted with a light snow and decorated with colorful ornaments, candy canes, boughs of holly, ribbons, bells, and bows. 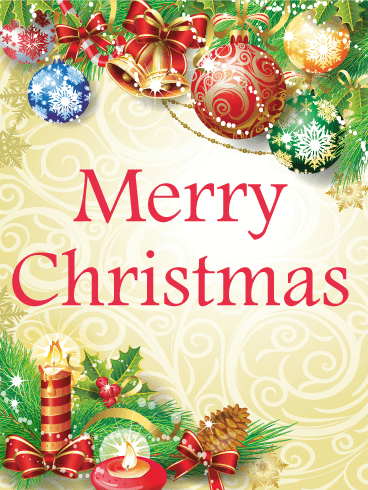 Send your wish for a "Merry Christmas" with this cheery card! Nothing says Christmas like the use of green and red! 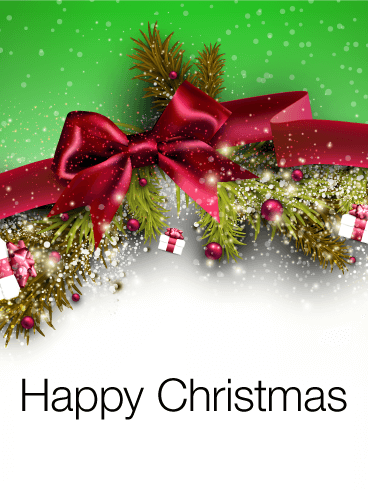 This Christmas card's background fades from green to white and features a silky red ribbon, tied elegantly around a bright bunch of green Christmas garland. 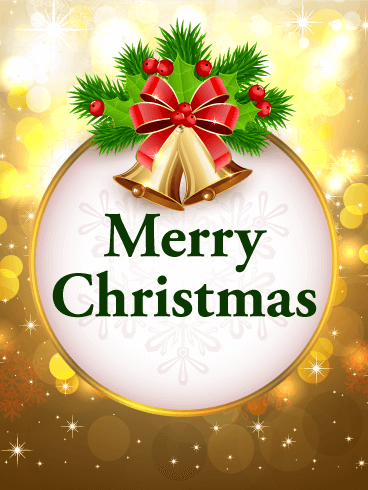 Shiny red ornaments and red-ribboned presents wrapped in white decorate the cheery garland as a gentle snowfall drifts down the card. 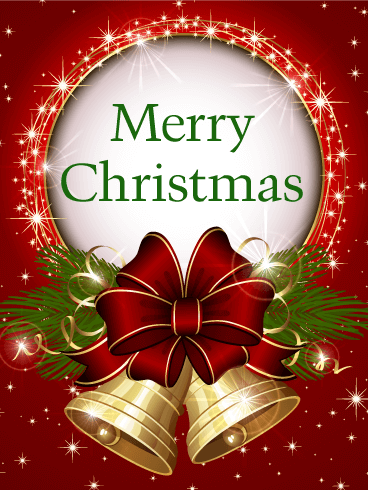 Send this Christmas ribbon & garlands card to say "Happy Christmas" today! Do you know someone who can't wait to open their presents this Christmas? Send them this Christmas presents card! 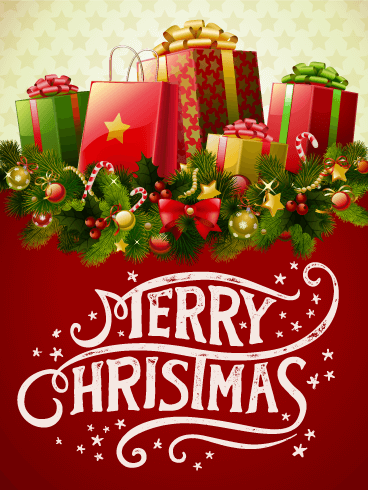 Five presents fill the top of this Christmas card, four of them in brightly wrapped and ribboned boxes and one in a red gift bag! They rest on a cheery Christmas garland, decorated with candy canes, winter berries, ornaments, stars, and bows. 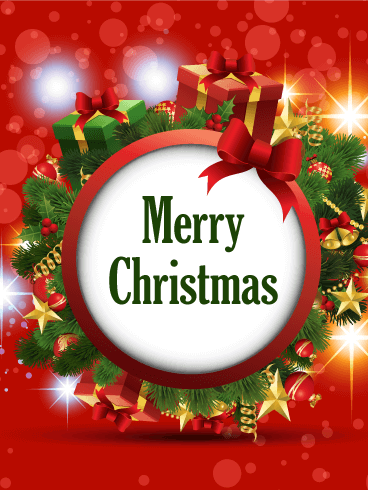 Below is a message of "Merry Christmas," the best way to send holiday greetings this season! What is waiting under the tree for you this year? 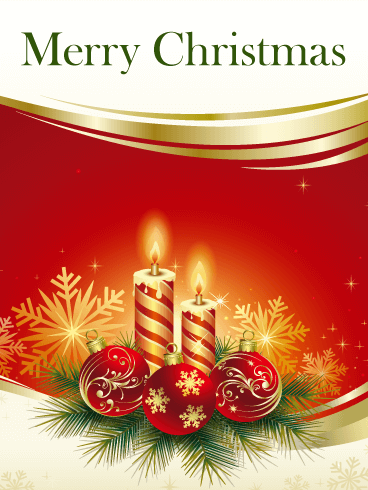 Give your friends and family a special gift with this shimmering Christmas ornaments card! The dark and bright red background has bright circles and sparks of light. 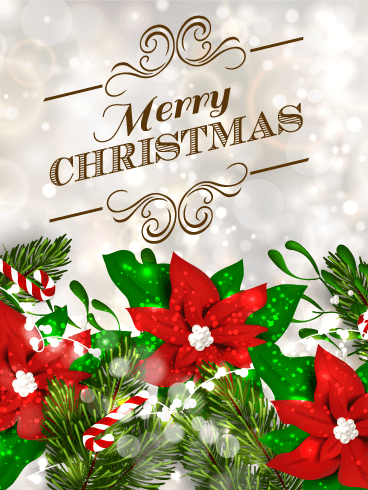 A Christmas tree branch fills the top of the card, decorated with snowflake-covered ornaments in gold, silver, and blue. 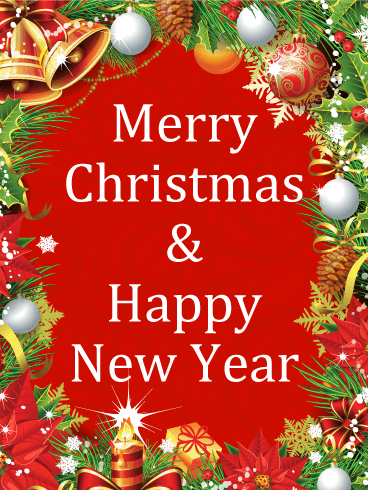 Use this Christmas card to say "Merry Christmas & Happy New Year" to your loved ones this holiday season! Oh Christmas tree, oh Christmas tree, how lovely are your branches! Known for their unchanging leaves and sturdiness, evergreen trees are an everlasting symbol of ability of Christmas to bring people together. Let this Christmas card cross the distance for you to let your friends and family know you want nothing more than to share a night around a Christmas tree with them this year. Greet the holiday with this festive wreath! Hung on doors to welcome in friends and announce the season, wreaths start every gathering right and spread festive cheer. This Christmas Card is a vibrant green and filled with presents, berries, and tasty gingerbread cookies. 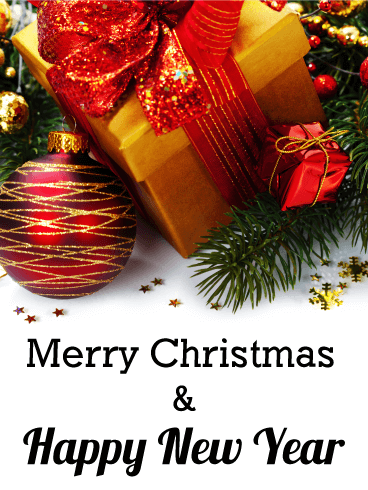 Send it early to be the first of your friends to welcome Christmas and solicit a time of merriness! The best winter is joined by the gleeful shout, "It's snowing!" Celebrate the joy of winter with this beautiful season's greetings card. The background features a homey wood floor and the bright green branches of a fir tree. The green branches are joined by a pine cone, gold ribbons, and bright red decorations, including a round ornament, cardinal bird ornament, winter berries, and a ribbon. 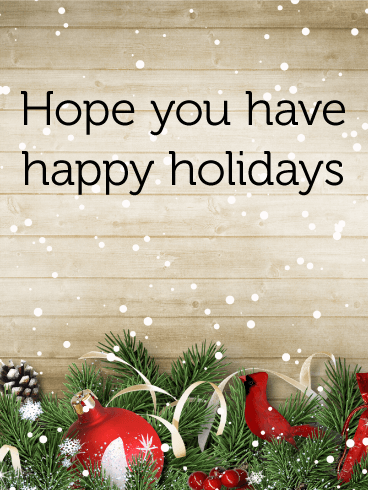 Send this season's greeting card and say, "Hope you have happy holidays" today! Celebrate the coming of winter and the holiday season with a cheerful and charming season's greetings card! 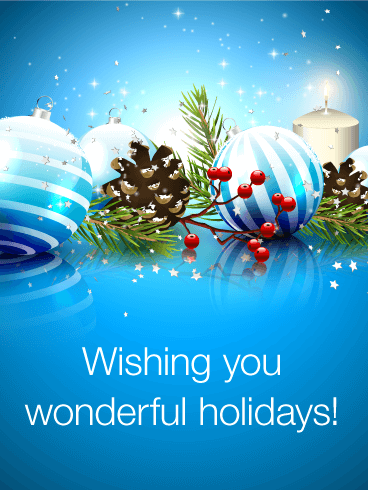 This card combines all the best elements of winter on a glowing blue background. Winter berries, snow-covered pine cones, a lit white candle, and ornaments striped with blue and white are joined by shining white stars. This message of "Wish you have happy holidays" will bring holiday cheer to everyone who gets this season's greeting card!